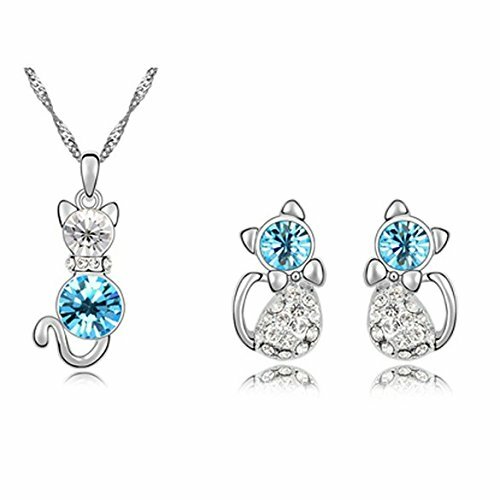 This set of little cat shape jewelry is perfect for quiet girl. High quality Swarovski Element tiny white crystals around the blue crystal in middle. 18K White Gold plated alloy prevent the necklace from allergies and fading. Well packed in a beautiful box with a cleaning cloth no need more package as a gift. Good gift choice for Valentines Day, birthday, anniversary, holidays, stocking stuffers, graduation, Christmas, Thank You or simply Thinking of You . Package size :3.2 inch. x 3.7 inch. x 2.3 inch.